Aqua, Caprylic/capric triglyceride*, Glycerin*, Aloe barbadensis leaf juice**, Glycine soja oil**, Cetearyl wheat straw glycosides°°, Cannabis sativa seed oil**, Prunus amygdalus dulcis oil*, Butyrospermum parkii butter***, Chamomilla recutita flower extract**, Tocopherol*, Parfum*, Glyceryl stearate*, Stearic acid*, Cetearyl alcohol*, Xanthan gum*, Sodium benzoate , Potassium Sorbate, Citric acid*, Limonene°, Linalool°. 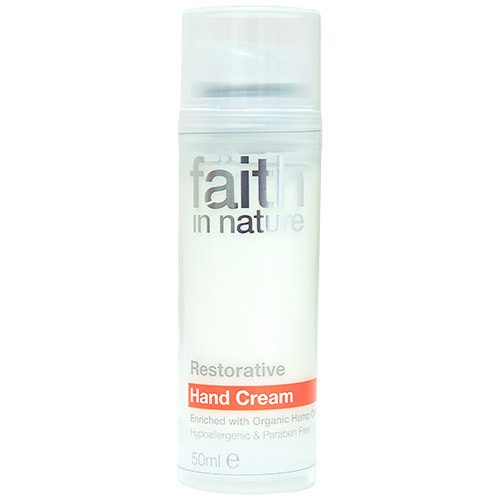 Below are reviews of Faith in Nature Restorative Hand Cream - 50ml by bodykind customers. If you have tried this product we'd love to hear what you think so please leave a review. Love this hand cream, especially as it was on offer with a free "face loofah". Goes on silky smooth and you only need a pea-size amount. I couldn't believe how soft & smooth my hands were in the morning (after a night application). Best hand cream ever. Shall buy again.